I have decided this review needs one of my Instagram pics to accompany it because this shot perfectly captures what my life has looked like recently. 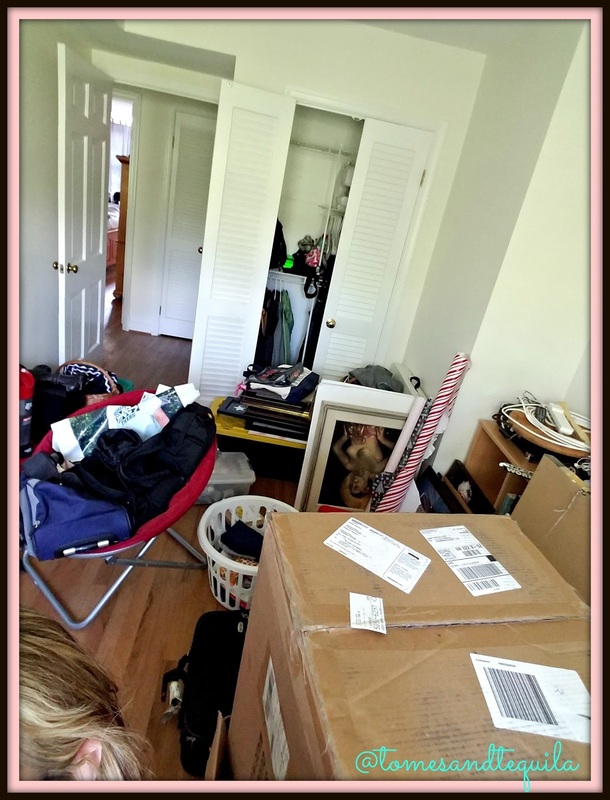 It has been full of chaos and stress, and I am so ready for a regular routine and a house that isn't a shambles...you have no idea. But...I am writing on my computer set up in what will be my new office...so I am happy and hopeful that there is indeed a light at the end of the tunnel. Mind you, y'all should see what the rest of the office looks like. I am wedged into a tiny cleared off spot in front of the window. My view is beautiful magnolia trees in bloom...but behind me leaves a lot to be desired. Anyway, I have a review for another book sent to me by Booksparks for their Summer Reading Challenge! 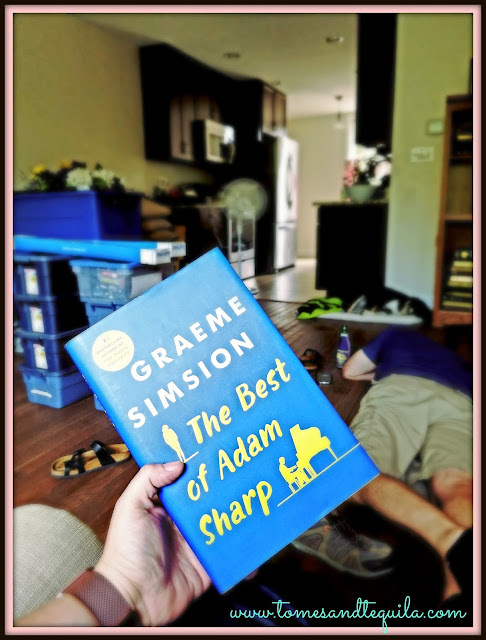 I was incredibly excited to see The Best of Adam Sharp by Graeme Simsion arrive in the mail from them because I am a HUGE fan of Simsion's previous book The Rosie Project. If you've never read that one, it's an incredibly unique tale of a man with Aspergers and his quest to find a mate. It was great, add it to your list if you haven't picked it up yet. But this one...eh...maybe I started off with too high of expectations?? First off, let me just say that I am not a fan of writing negative reviews. I drag my feet and put them off until the last minute, mainly because I know that not everyone has the same taste in books. What I like or love, and what you like or love, may be completely different. It is all subjective. So let me just say that I may not be the target audience for this particular book. And it's the only one I've received from Booksparks that I feel wasn't the right fit for their Summer Reading Challenge. The Best of Adam Sharp tells the story of an IT guy nearing 50 who is waxing nostalgic about the 3 month affair he had in his 20's with an actress in Australia after she sends him an e-mail out of the blue. His long-term relationship has gone stale and he's bored, so the idea of rekindling some sort-of "thing" with his long lost love brings Adam back to life. What happens from there is pure man fantasy. Let me start with the good. I am a big music fan, so I loved that the book was filled with music...and included a playlist in the back of every song mentioned in it's pages. That right there was a giant plus. I hate when books have a heavy focus on music and don't include a playlist. If Fifty Shades of Grey had included a playlist, I would've probably given it another star (I'm only halfway joking). Yes, a halfhearted perusal of Google can usually give you a fan made list, but authors...if you're reading this...add a playlist in the back of the book. Your fans will love you for it. Now, as for the rest of the book...if I'm being brutally honest with you, the first half was pretty bland and boring to me, and the second half was just weird, and came off as a man's midlife crisis fantasy. I struggled to read it, and normally I'm a reader who hates to put my book down until I'm done...dinner, dishes and life be damned. But for this one, I'd read a chapter and put it down...then a few hours later pick it back up again for another chapter. It just wasn't the book for me. Even in the sections that were fantastical, the writing seemed repetitive and after awhile I started to skim. And that right there should tell you a lot. So, who do I think might love this book? A middle-aged man who loves music. Who probably won't love this book? A middle-aged woman named Christina, clearly. I am trying very hard to not make this a review that could be quoted on the next "Authors Read Mean Reviews" video...but I'm struggling to find something good to say besides the fact that I'll never forget that Bruce Springsteen AND Patti Smith wrote the song Because the Night. And that factoid is negated by me having the song Angel of the Morning stuck in my head for a week. But the next book up for review should be a positive one because I'm halfway through it and absolutely HOOKED. And hopefully the posts should be coming to you more regularly again...pending I don't get lost trying to get to my computer desk! Have a great weekend folks! !